Whilst the doors on a car are undeniably useful, they are seldom a key part of the overall design. But in the case of the 'Gullwing', they definitely were. And whilst the seagull might not be considered elegant, as such, the 300SL most certainly was. Though not if on its roof, as the result of an accident - when prising those gull-wing doors open would have been no mean feat! Even with the SL's 'rubber side down', things were not necessarily glitch-free. 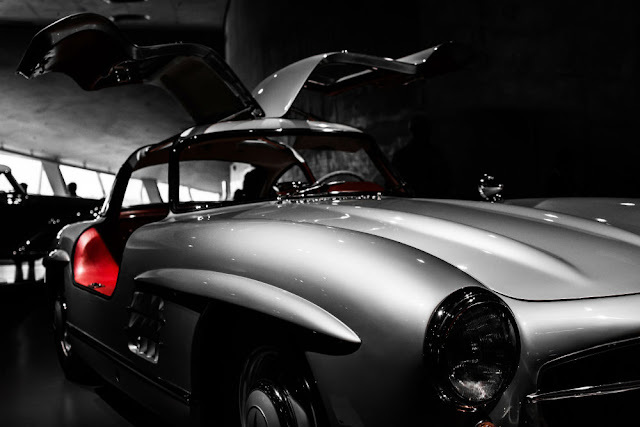 The Gullwing's handling was nowhere near as taut as that of a Mercedes-Benz of today. For starters, its rear suspension was way too soft. Comfort was not exactly contemporaneous, either. In the event of rain, the 300SL's bodywork was not quite as 'well-sealed' as it might have been! And its tubular 'SuperLight' space-frame - though well-engineered - was a pain in the neck for mechanics! Most bizarrely of all, the engine is tipped 45° - the better to accommodate a lower bonnet line. Again - while designers no doubt cheered that to the rafters - mechanics were not quite so keen! To be fair to the SL, it was trying to span the gap between Le Mans prototype, and roadster. For sheer style, it had few peers. And while it did not come cheap, if you had the funds, the Gullwing was actually good value for money. Though - with those technical blemishes - a pocketful of patience came in handy, too!